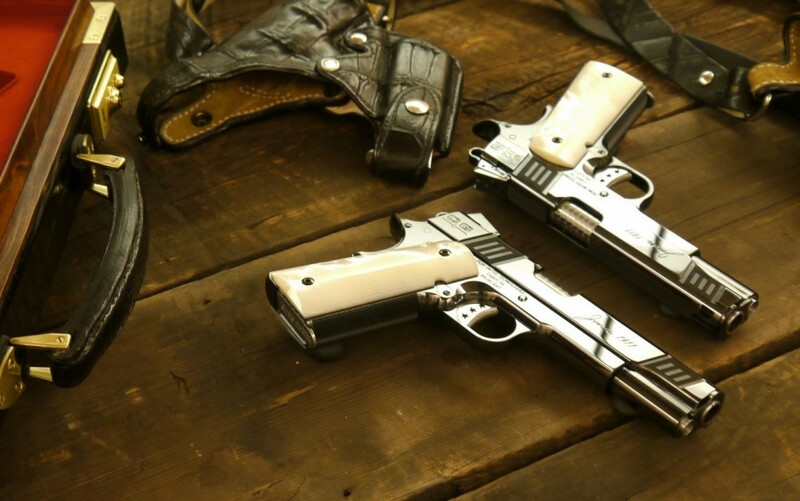 Wrapped in authentic mother of pearl grips meticulously sculpted and smoothed by artist Brian Challis, this mirror image pair of Jones Deluxe pistols features a level of craftsmanship which in this day and age is simply near non-existent. The grips themselves seem to radiate back the body heat of those who lay hands on them, becoming living extensions of the shooter’s body and soul. The pistols are perfect mirror-copies of each other, not just in name but in engineering and function too. The ejection ports, control surfaces – even the rifling of the barrels are perfectly mirrored from one to the other. The serial numbers of this one-of-a-kind pair have been coordinated MRJLEFT and MRJRIGHT, leaving you with nothing shy of artfully matched perfection both in spirit and execution. The Cabot Guns’ logo astride the rear of both slides broadcasts to all who look upon them in bold and beautiful jubilee the commitment to precision that is the Cabot way. Every masterpiece deserves its proper display – presentation as important as pedigree. In the case of The Pearls, nothing but a one of kind case birthed of equal quality to the passion that went into the set themselves would suffice. 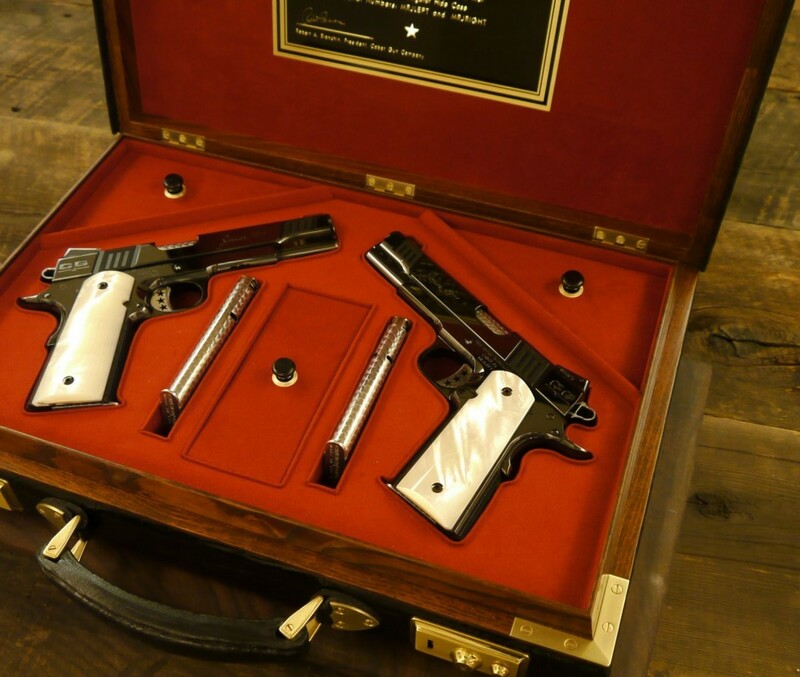 Master case craftsman Marvin Huey has laid hand to material and envisioned for these pistols a fitted French case of outstanding alligator hide, his art flowing to the inside of the case and fully enveloping The Pearls in warm crimson providing fr a stunning visual contrast. Complete with display placard on the inner top lining, coordinated cut-outs for bushing tools and ammunition and similar precision cuts for the brace of jeweled matched-magazines each created for the right and left, the case itself takes close second to the breathtaking artistry contained within. Display refers not only to static observation, but in the case of a tool turned art also for the presentation of its daily wear. As the owner of The Pearls, it may strike you to carry them – the warmth of mother of pearl tucked beneath your arms and ever-ready at your side. For this purpose, Cabot commissioned master gun leather artisan Sam Andrews to create a one-of-a-kind shoulder rig crafted specifically for these pistols and matched perfectly to the master-grade case they rest in. Wonderfully executed, this accoutrement completes the full-package of one-of-a-kind, never before seen and doubtful to be seen again confluence of craftsmanship that is The Pearls.